I shoot a lot of different subjects, a heck of a lot of sport/action pics, getting more and more events/portraits, and i even do a little architecture/landscape stuff. Shooting landscapes is a lot tougher than it sounds, there are a few variables to consider, lighting and weather conditions, the actual landscape itself, how do you want to capture the landscape. Thanks to digital, we can do a few things, with stitching processes we can now create massive panorama images using a stack of images, or really dramatic images using multiple images to create the look of huge dynamic range. The other way to go is to use simple technique and patience to create stunning single frame images. Things like sun position, clouds, buildings/trees/roads etc can affect images. 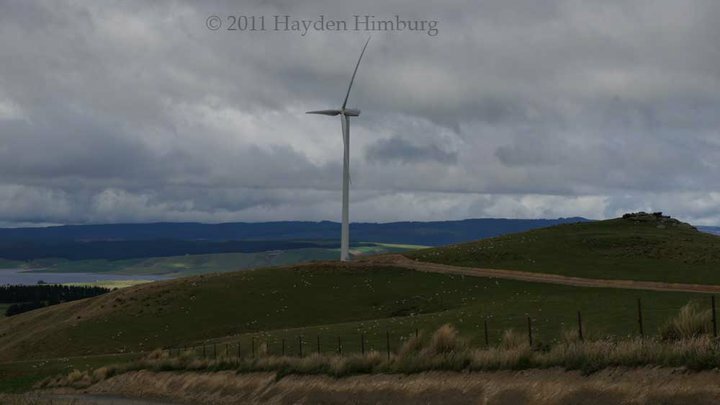 I like this image a lot, i was with a couple of buddies doing a one day road trip around the back blocks of Dunedin City, One area we visited is called Mahinerangi, here the powers at be decided it was a great place to dump a wind farm, the landscape is gorgeous, until they dumped 13 gigantic wind turbines there. Normally this image would be stunning with the big sky, lake poking out from around the hills but the turbines dominate landscape now. 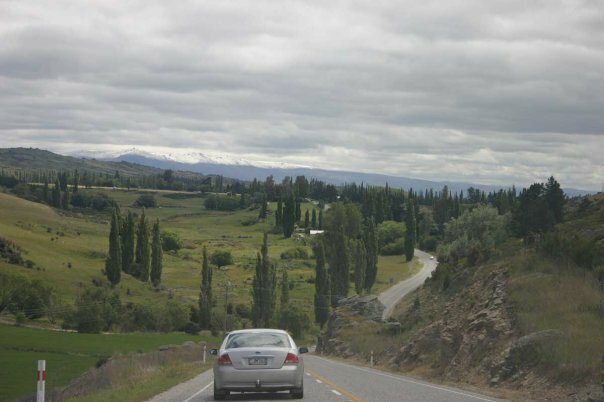 The image was actually nothing more than a random snap on a roadie, but when i got it home i have actually cropped it slightly to remove the road and hood of the vehicle we were driving that day and a little curve adjustment and thats it. Architecture is another one that is tough, especially large buildings, if you shoot from ground level you generally get images where the corners of the building look like they are trying to meet in the middle. There are lenses out there that can correct this, but they are expensive. Architecture images are not just about recording a building, they can also be used as an emotive to show history, and drama of the design. 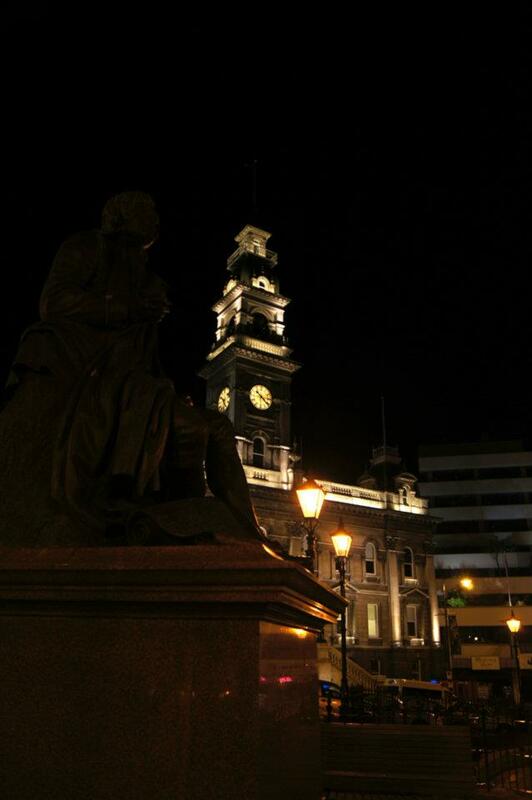 This image is in Dunedin City’s Octagon, the building is the town hall/Municipal chambers, this gorgeous piece of architecture is well lit at night, and the statue of Scottish Poet Robbie burns adds to the dram as he is not lit at all. I took this pic one night on a random walkabout town. I had a tripod, set a semi long exposure and took several frames slightly changing position each frame and this one was the best as it shows the old architecture of the chambers, and the newer architecture of the council plaza building beside it. Architecture is not just about buildings, the port is designed, the way the harbor and wharves interact with the landings is designed to maximize use of the land and harbor. The image was hand held from a monument lookout above Dunedin’s Port Chalmers. It is actually a composite panorama created using 5 separate images stitched together using photoshop. I could probably have done it better too i could have used a slightly wider angle lens and kept the tops of the cranes in the frame which would also show the surrounding hills a lot nicer.